The Electric Vehicle (EV) market in the Las Vegas / Henderson area is growing. With the addition of more local solar infrastructure and the electric car manufacturer, Faraday building a manufacturing plant in North Las Vegas, you can plan on seeing and maybe even owning your own EV in the future. In the past, a nonexistent charging infrastructure meant limited range and mileage, but as charging stations are more prevalent locally and nationally, owning and driving an electric car has become more practical. If you are considering an EV, part of that purchase will need to including a home charging station. And letting Penny Electric help with the professional installation of your EV’s power supply in your garage or carport is easier than ever. The first step is identifying and purchasing the compatible Electric Vehicle Supply Equipment (EVSE). 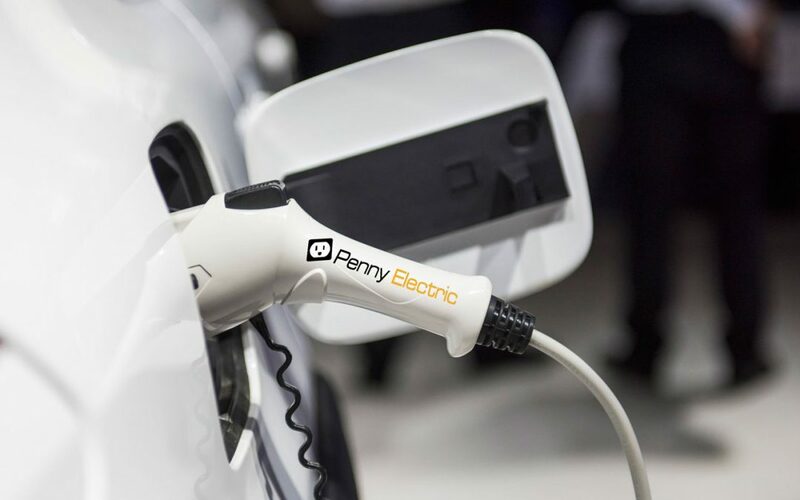 Penny Electric typically suggests choosing the EVSE based on options recommended by your your EV manufacturer. The EVSE is the charging terminal, or the “plug” that delivers power to the car to charge it while it is parked at your home. This consists of a charging cable and a panel containing the electrical components which produce various voltage and current levels while controlling the vehicle’s charging rate. The make and model of the vehicle you own and its battery cell system will determine the type and power rating of the EVSE you need. Whether your Toyota Prius, Tesla, Nissan Leaf, or Chevy Volt requires Level I 120 volt trickle charge plug in, a Level II 240 volt 30 amp continuous load hardwired or a Level III 30 minute full charge capability via a specified cable receptacle, Penny Electric can manage the EVSE installation for your vehicle. The second component for home EV charging is an independent circuit to deliver power to your charging equipment. This typically involves running a power supply cable from your home’s master breaker panel to a power outlet where your EVSE will be mounted. During EVSE installations, Penny Electric will always ensure that the proper cabling, wiring configuration, receptacles and breakers specified by your EVSE provider are used to accommodate the different voltage and amperage requirements. Penny Electric is one of Las Vegas’s leading installers of EVCS and you can be certain that our licensed electricians will complete your home charging station with the proper permitting and local electrical safety codes compliance. With the unstable price of gasoline, driving an EV is a good way to remain unaffected by rising gas prices. Its also a good way to raise your homes value and lower your family’s carbon footprint while saving money. With the growing development of a local and national charging infrastructure and increased consumer demand for better, more efficient electric vehicles, it’s a great time to own and drive one!